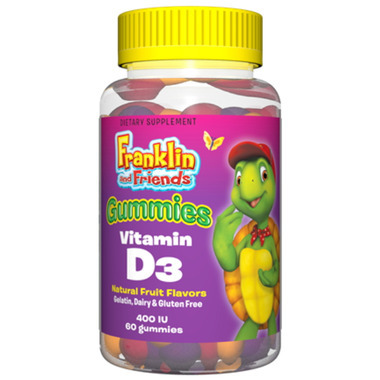 Webber Naturals Vitamin D3 Gummies are naturally sweetened vitamin D3 gummies for growing bodies. Children need vitamin D for normal growth and development, but they don’t always get adequate amounts. Vitamin D3 is formed in the skin by sunlight, but the skin cannot make enough during northern winters and may be limited on summer days when clothing or sunscreen covers the skin. Research shows that the “sunshine vitamin” is important for calcium and phosphorus absorption and for building healthy teeth and bones. * It also plays a critical role in development of the cardiovascular, immune, and nervous systems. * The amount of vitamin D3 recommended for children and adolescents was recently doubled to 400 IU by the American Academy of Pediatrics. Only vitamin D3 (also called cholecalciferol) is the same as the form made by the skin on a sunny day. Treehouse Vitamin D3 Gummies are an easy way to give your children an age-appropriate dose of this important nutrient and support their development and long-term health. * They come in delicious, naturally sweetened fruit flavors that kids will enjoy. They contain no high fructose corn syrup or aspartame, and are free from hydrogenated oils and common food allergens such as gluten, wheat, and dairy. For kids 3 years and older. I do like these for the fact that they don't have high fructose corn syrup. But they still have evaporated cane juice. Which although is technically better is still an added sugar. But it was a nice transition from the drop version. I will probably look for one with less added sugar. These are great. My kids love them, and I like that they're naturally flavoured. We'll definitely be ordering some more.